Grand Central Publishing, 9781538712207, 368pp. An entertaining and insightful homage to Tom Hanks, America's favorite movie star, from the New York Times bestselling author of the cult sensation The Tao of Bill Murray. Niceness gets a bad rap these days. Our culture rewards those who troll the hardest and who snark the most. At times it seems like there's no place anymore for optimism, integrity, and good old-fashioned respect. Enter "America's Dad": Tom Hanks. Whether he's buying espresso machines for the White House Press Corps, rewarding a jovial cab driver with a night out on Broadway, or extolling the virtues of using a typewriter, Hanks lives a passionate, joyful life and pays it forward to others. Gavin Edwards, the New York Times bestselling author of The Tao of Bill Murray, takes readers on a tour behind the scenes of Hanks's life: from his less-than-idyllic childhood, rocky first marriage, and career wipeouts to the pinnacle of his acting career and domestic bliss with the love of his life, Rita Wilson. As he did for Bill Murray, Edwards distills Hanks's life story into ten "commandments" that beautifully encapsulate his All-American philosophy. Contemplating the life, the achievements, and the obsessions of Mr. Tom Hanks may or may not give you the road map you need to find your way. But at the very least, it'll show you how niceness can be a worthy destination. Gavin Edwards is the New York Times bestselling author of nine books, including The Tao of Bill Murray, Last Night at the Viper Room, Can I Say (written with Travis Barker), VJ (written with the original MTV VJs), and 'Scuse Me While I Kiss This Guy. As a longtime contributing editor for Rolling Stone, he has written a dozen cover stories for the magazine, traveled the world from Bahrain to New Zealand, and taken a city bus to the Grammys. He lives in Charlotte, North Carolina, with his wife and their two sons. "If there is a new Mr. Rogers in our culture, it's got to be Tom Hanks: honest, decent, trustworthy. 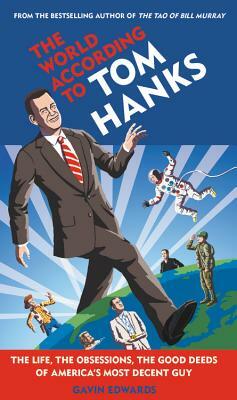 Gavin Edwards's book taps into what makes Hanks someone we love and someone we should emulate. "—Morgan Neville, director of Won't You Be My Neighbor?